June 05, 2018 at 8:09 pm. 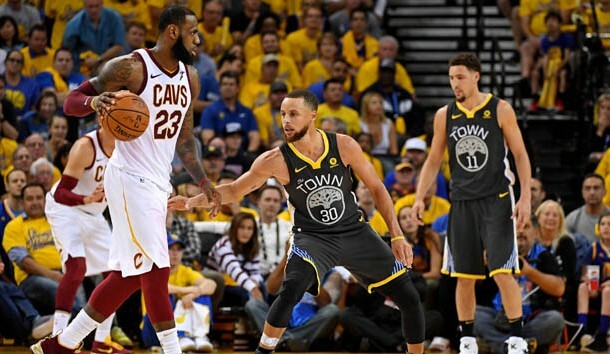 CLEVELAND, Ohio — Of all the games in this four-years-running Finals saga between the Cavaliers and Golden State Warriors, Game 3s have been Cleveland’s best. As in, it’s the only game the Cavaliers have won more than once. The Warriors are in Cleveland for Game 3 Wednesday with a 2-0 lead in this series. It was the same a year ago at this time and the Cavaliers were on the verge of winning another Game 3 but blew a six-point lead over the final 3:09 and lost, 118-113. The year before, trailing 0-2, the Cavaliers hammered the Warriors by 30 in Game 3 and eventually won the series for their first championship. “All three games were really, really difficult,” Golden State coach Steve Kerr said. “So we’re used to that. We’re used to the dynamic of being ahead in a series and then having everything shift when you go on the road. But especially when you play Cleveland — LeBron, this crowd and their environment, we know the kind of force they’re going to bring. James is averaging 40 points, 8.5 rebounds, and 10.5 assists so far in this series. He became the first player to ever score at least 50 points (51) in a Finals game and lose in Game 1, when the Cavaliers lost 124-114 in overtime. Only 20 teams have ever recovered from an 0-2 deficit in the playoffs, but James was responsible for three of those comebacks. The latest was the last round against Boston, when the Celtics won the first two games at TD Garden but James and the Cavaliers took the series in seven. “I know it feels like we’re down 2-0, and I don’t like the way I feel,” James said. “I don’t like the way — the mood that I’m in right now, knowing whatever. There’s no, like, OK, you’re down 2-0 and you feel better than when you’re down 2-0 before. Cavs coach Tyronn Lue said Rodney Hood, who fell out of the rotation for good early in the conference finals, would get a chance in Game 3. Hood is 25 and 6-foot-8 who can score off the dribble in catch-and-shoot situations and can switch on defense. But he’s been miserable in the playoffs, averaging just 4.4 points and shooting 15 percent from 3-point range. Lue didn’t say which player would lose minutes to Hood, nor did he address any other potential adjustments or lineup changes. Curry set NBA Finals records for 3s (nine) and attempts (17) and is averaging 31 points and 8.5 rebounds in the series. Durant is giving the Warriors 26 points and nine boards so far in the Finals. Andre Iguodala (knee) was upgraded to questionable for Game 3. He hasn’t played since Game 3 of the Western Conference finals. Curry is looking for his third championship in four years — all against Cleveland. “In the Finals, this is the only building I know what that experience is like,” Curry said. “We know how the atmosphere is here. We know how Cleveland plays here, with a lot of energy and force.